We mentioned CELZ at the outset of this week, in our report from Monday morning, and we wanted to return today to recap the stock’s excellent performance since then. On Monday a low of .0283 was recorded, and after a few bullish sessions it attained a new high of .0575 yesterday. That worked out to a three-day increase of 103% on steadily rising volume, and with the PPS now currently in blue skies, we’re going to be very interested to continue monitoring the activity in CELZ as we head into week’s end. We would also like to recap the performance of the options ideas we submitted for General Mills yesterday. The pair of contracts we highlighted, the GIS Weekly $45 & $47.50 Calls, each managed to produce notable intraday moves. The $45 Calls ran from a low of 1.22 to as much as 2.39 for a gain of 96% The $47.50′s fared slightly better, trading up from a low of .34 to .78; a 129% single-session rip. As our regular readers are perfectly aware, we never stop looking for earnings related options plays. Even now, amid a relative lull in quarterly reports, we’re seeing an interesting possibility with General Mills. After its Q4 earnings report this morning, wherein a solid beat on profits was achieved, the stock is up to the tune of 2% in the premarket. There is also a large gap on the chart to the $50-area. In this situation, we’re interested in tracking the GIS Weekly $45 & $47.50 Calls for the remainder of the week. We wanted to come back to comment on TRXC this morning as well. We tagged this stock for observation just a shade over a month ago on May 23rd, and since that time, the stock has enjoyed a very solid uptrend which has led to new highs this week. On the day of our initial alert on TRXC, we had observed a low of 2.82, and the srtock never fell below that point. Yesterday’s new high came in at 5.70, marking an upswing of 102% in a matter of four and-a-half weeks! For something new to put on our radars this morning we also want to make mention of KOPN. 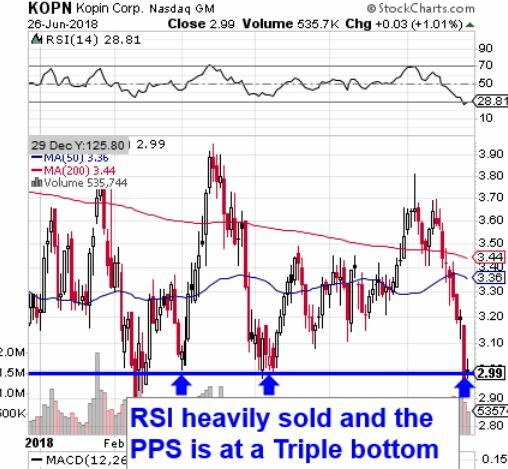 As you can on the annotated chart below, at the present time, KOPN is displaying a strong multiple bottom formation, in addition to having just reached heavily oversold territory. We are going to place KOPN on watch in the days ans perhaps weeks ahead and will be interested to see how it behaves with this cherry of a technical setup. Our first order of business today will be to recap the fantastic single-session performance posted by our fresh options ideas for CarMax. We highlighted the KMX Weekly $75-78 Calls and were impressed with the subsequent trading activity. Traders could have banked the following profits off of those ideas, all of which breached into multi-bag gain territory. Another pick of ours that we want to return to was one we made midway through last month, in TNDM. The stock has has essentially been on one continuous bull run since that time. From the 11.38 low it registered on the morning on our initial alert (May 16th) the stock gradually reached a new high on Friday coming in at 25.50. That’s an increase of 124% in just five weeks! We would consider that beyond respectable for a stock that was trading over eleven bucks when we first called it.